From Princess Leia herself: another brilliantly hilarious self-examination of her unlikely life and times. A thoroughly original and intimate memoir by the bestselling author of Postcards from the Edge and Wishful Drinking. 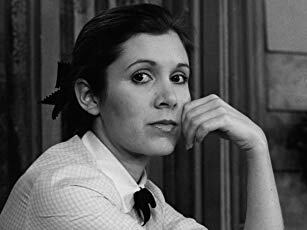 Carrie Fisher, the daughter of Debbie Reynolds and Eddie Fisher, became an icon when she starred as Princess Leia in the original Star Wars trilogy. Her eclectic Hollywood career includes roles in numerous films such as The Blues Brothers, When Harry Met Sally and the recent world-wide blockbuster, Star Wars: The Force Awakens. She is the author of such international bestselling novels and non-fiction as Wishful Drinking, Surrender the Pink, Delusions of Grandma, The Best Awful, and Postcards from the Edge, which was made into a hit film starring Shirley MacLaine and Meryl Streep. Fisher's experience with addiction and mental illness--and her willingness to speak honestly about them-- made her a sought-after speaker and respected advocate before her death in 2016. Another amazing book written by Carrie. Sadly her last. Her writingswill be missed. Behind the scenes on the set of the first ever Star Wars movie in 1977. Carrie Fisher is brutally honest about her co-stars and her own self doubts in the role of Princess Leia. A timely read in true Carrie Fisher style. A great reminder of what we have lost.